The first drilling for oil in ocean waters took place in 1896, off the coast of California. Since then, offshore drilling has pushed the limits of technology and innovation, with the deepest wells now being drilled in waters more than 2,900 meters deep in the Gulf of Mexico. Oil and gas represents a significant source of energy as well as revenues, but the development of oil and gas resources can pose considerable impacts on marine mammals and marine environments. The Commission’s 2010–2011 annual report (Chapter 3) and 2012 annual report (Chapter 5) provide summaries of oil and gas development in the United States and the associated impacts on marine mammals, as summarized below. The Commission regularly reviews and comments on Bureau of Ocean Energy Management (BOEM) proposed oil and gas activities and on proposed Marine Mammal Protection Act (MMPA) incidental take authorizations in all U.S. federal waters, also referred to as the U.S. Outer Continental Shelf (OCS). We also comment on and promote environmental studies to better understand the potential effects of oil and gas activities on marine mammals, and facilitate efforts to identify, prioritize, and address information needs through the convening of workshops and meetings. The products of Commission-sponsored projects and workshops are made available through workshop reports. See the April 2015 Gulf of Mexico Marine Mammal Research and Monitoring Meeting summary. Office of Natural Resources Revenue (ONRR): charged with royalty and revenue management for offshore energy leasing and development, including the collection and distribution of revenue, auditing and compliance, and asset management. The Outer Continental Shelf Lands Act (OCSLA) provides the statutory and regulatory framework for oil and gas development on the U.S. OCS. The Act outlines a four-stage process for oil and gas development. The 2012-2017 leasing program for oil and gas leasing in U.S. offshore waters was approved by the Department of the Interior (DOI) in August 2012 with 15 proposed lease sales. The leasing schedule included two lease sales in the eastern Gulf of Mexico, annual lease sales in both the central and western Gulf of Mexico, one lease sale each for the Beaufort Sea and Chukchi Sea (in the Arctic), and a special lease sale in Cook Inlet. No lease sales were proposed for other areas of Alaska, the Atlantic, or the Pacific. The Beaufort and Chukchi Sea lease sales were cancelled by BOEM in October 2015 due to market conditions and low industry interest; other lease sales occurred as scheduled. The final lease sale in the 2012-2017 five-year program was held for the Cook Inlet OCS planning area in June 2017. The development of the 2017-2022 leasing program was initiated by BOEM in June 2014. The Draft Proposed Program was issued in January 2015 followed by the Proposed Program in March 2016 and the Proposed Final Program in November 2016. The leasing schedule included eleven lease sales in four OCS planning areas, including one sale in Cook Inlet and ten area-wide lease sales in the Gulf of Mexico region. BOEM issued a final Record of Decision on the 2017-2022 leasing program in January 2017. BOEM is now in the process of developing a new five-year National OCS Oil and Gas Leasing Program for 2019-2024. On January 4, 2018, BOEM announced the availability of its Draft Proposed Program. The program considers 47 lease sales in 25 of the 26 OCS planning areas, to include 98% of the estimated Undiscovered Technically Recoverable Oil and Gas Resources. 19 lease sales in the Alaska Region, including 14 of the 15 planning areas (the North Aleutian Basin is under Presidential Withdrawal). 7 lease sales in the Pacific Region. 12 lease sales in the Gulf of Mexico Region. 9 lease sales in the Atlantic Region. The comment period on BOEM’s Draft Proposed Program closed on March 9, 2018. The Commission submitted comments at each stage of the development of the proposed, current, and past five-year leasing programs (see letters section below). President Barack Obama issued several directives related to oil and gas leasing in offshore waters of the United States. In March 2010, the President withdrew the Bristol Bay planning area from leasing through 30 June 2017. In December 2014, the President withdrew the entire North Aleutian Basin planning area, which includes Bristol Bay, from all future leasing. In January 2015, the President withdrew certain areas within the Beaufort and Chukchi Sea planning areas in the Arctic from future leasing, including Hanna Shoal within the Chukchi Sea. In December 2016, the President withdrew all areas of the Chukchi and Beaufort Sea from future leasing, with the exception of certain coastal areas in the Beaufort Sea. At the same time, the President withdrew from future leasing certain offshore canyon areas of the Atlantic OCS. On 28 April 2017, President Donald Trump issued Executive Order 13795: Implementing an America-First Offshore Energy Strategy. It encourages energy exploration and production on the OCS to “maintain the Nation’s position as a global energy leader and foster energy security and resilience for the benefit of the American people, while ensuring that any such activity is safe and environmentally responsible.” As such, the Executive Order directs the Secretary of the Interior to consider revising the schedule of proposed oil and gas lease sales for 2017-2022, including, but not limited to, annual lease sales in the Western Gulf of Mexico, Central Gulf of Mexico, Chukchi Sea, Beaufort Sea, Cook Inlet, Mid-Atlantic, and South Atlantic OCS planning areas, ensuring that any revisions made do not hinder or affect ongoing lease sales. In response to Executive Order 13795, the Commission submitted comments to BOEM on the development of a new five-year National OCS oil and gas leasing program for 2019-2024, and to NOAA on both the Marine Mammal Acoustic Technical Guidance and the review of National Marine Sanctuaries and Marine National Monuments (see letters section below). In February 2014, BOEM published a final programmatic environmental impact statement (FEIS) on geological and geophysical (including seismic) surveys for the Mid- and South-Atlantic planning areas. The FEIS was conducted in response to the receipt of several permit applications to conduct seismic airgun surveys in the Mid- and South Atlantic planning areas, and the potential inclusion Atlantic OCS lease sales in the 2017-2022 five-year leasing program. The proposed seismic surveys would be used by industry and BOEM to update available geological and geophysical data in some areas and acquire first-time data in others to appraise the resource potential of oil and gas energy in the Atlantic OCS. 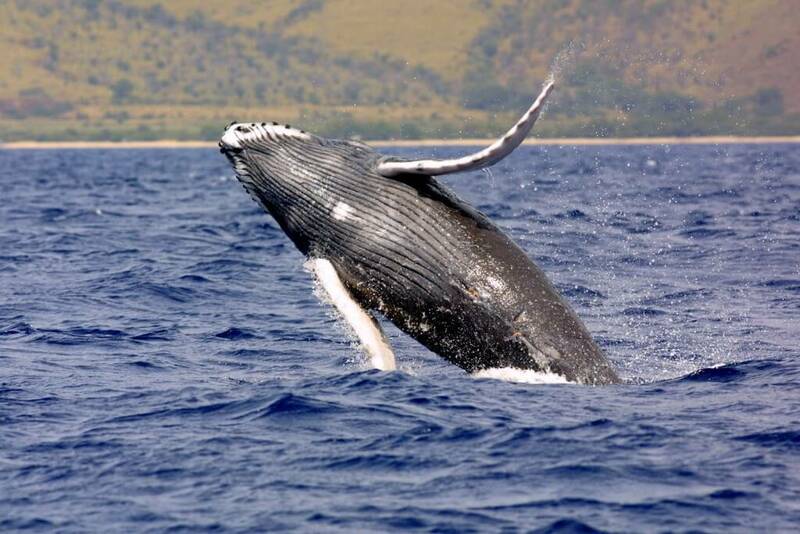 In July 2015, NMFS issued a notice announcing the receipt of applications from three seismic survey companies for authorization to take marine mammals incidental to the proposed seismic surveys. In January 2017, BOEM announced that it had denied six pending permit applications, based in part on the diminished need for seismic survey information following the removal of the Atlantic OCS from the 2017-2022 leasing program. However, in May 2017, in response to President Trump’s Executive Order, Secretary Zinke announced that DOI would resume its evaluation of Atlantic geological and geophysical applications to inform future decisions regarding the inclusion of the U.S. Atlantic OCS in a revised five-year leasing program. In November 2018, NMFS announced that it issued incidental harassment authorizations to five companies seeking to conduct seismic surveys in the Atlantic Ocean. In June 2018, NMFS issued a proposed rule for marine mammal take authorizations related to oil and gas-related geophysical surveys in the Gulf of Mexico. The proposed rule dealt primarily with seismic surveys used in oil and gas exploration and development, but also included consideration of high-resolution geophysical surveys. The proposed rule was informed by BOEM’s final programmatic environmental impact statement (FEIS) on geological and geophysical activities in Gulf of Mexico waters, issued in August 2017. The Commission submitted comments to BOEM on the programmatic EISs for both the Atlantic and the Gulf of Mexico and on a long-term monitoring program for the Gulf. The Commission also submitted comments to NMFS on the Atlantic OCS incidental take applications, and on the Gulf of Mexico proposed rule to authorize marine mammal takes incidental to oil and gas-related geophysical surveys (see letters section below). Oil and gas development in the marine environment proceeds in stages, all of which have the potential to impact marine mammals. For an overview, see stages of oil and gas development and environmental effects of concern for marine mammals. Exploration for oil and gas is the process of searching for and characterizing hydrocarbon reserves. The exploration stage involves such geological and geophysical surveys (including seismic surveys, high-resolution geophysical surveys, and gravity and magnetic surveys), sediment sampling, and exploratory drilling. 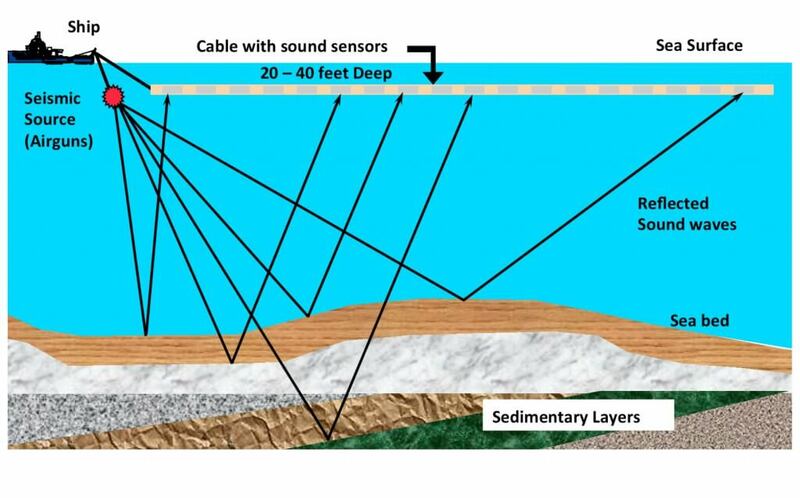 Seismic surveys use a controlled sound source, such as an airgun, to transmit sound waves to the ocean floor. The pattern of reflected waves reveal subsurface features that can indicate the presence of hydrocarbons. Seismic surveys can vary in sound intensity and in the amount of geographic area covered. In general, 2-D seismic surveys are used to collect seismic data over a broad area, 3-D surveys are used to collect a larger set of measurements over a smaller area, and 4-D (or time lapse) surveys are used to collect dense measurements in the same small area repeatedly over time. Wide-azimuth seismic surveys collect geophysical data from many different angles, and are used primarily in the Gulf of Mexico to investigate oil trapped below salt domes and other subsurface structures. Seismic airguns emit high energy, low-frequency impulsive sound that travels long distances. Marine mammal response to seismic surveys can cause disruption of important marine mammal behaviors, and—at close range—physiological injury. Sound from airguns can also mask biologically important sounds, including communication calls between individuals of the same species. 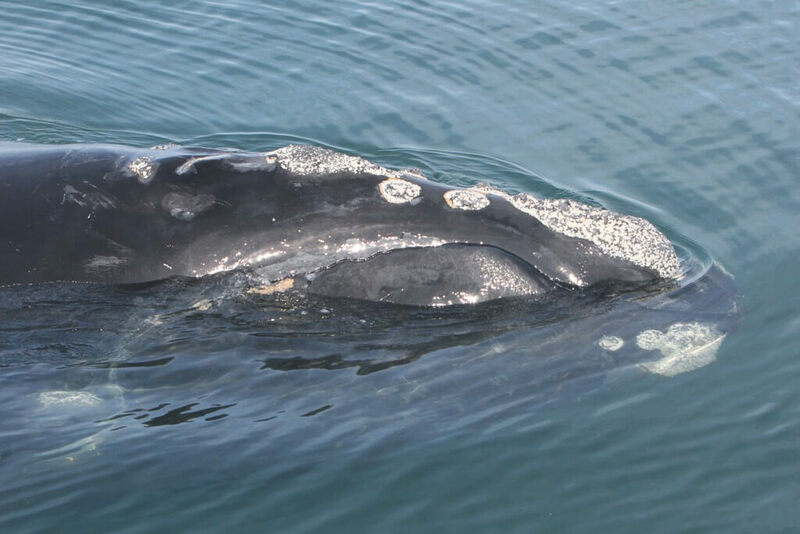 Baleen whales (e.g., North Atlantic right whales) may be affected by seismic survey activity more so than other cetaceans because of their sensitivity to low-frequency sounds. However, other cetaceans also may be affected. Once seismic surveys are completed, exploratory drilling is used to confirm the presence of hydrocarbon reserves and to make decisions regarding the economic feasibility of developing an oil and gas field. Exploratory drilling in offshore waters generally involves a single well and can occur over weeks, months, or even years, depending on the depth of the well and other geophysical features, weather, availability of equipment or personnel, safety concerns, or other issues. After exploratory drilling has ceased, wells are capped and abandoned either temporarily or permanently. Exploratory drilling may impact marine mammals based on disturbance by sound emitted during drilling, during seismic profiling of the well, and from support vessels or aircraft. Drilling can also result in oil spills, which can affect marine mammals directly by contact, inhalation, or ingestion, or indirectly by affecting marine mammal prey or habitat. For a more thorough discussion of the potential effects of an oil spill on marine mammals, see our Deepwater Horizon Oil Spill page. If suitable oil and gas reserves are found, the next stage of development involves construction and installation of drilling platforms or structures and transport systems (e.g., pipelines). Construction begins with site surveys and planning, which can involve high-resolution geophysical surveys and result in sound-related effects. Impact pile driving during construction of shallow-water platforms also can be a significant source of low-frequency sound. Both shallow- and deep-water construction can require aircraft and vessel activity, which can cause marine mammals to avoid or move away from preferred habitat and increase the risk of ship strikes. The construction and anchoring of infrastructure and equipment can alter or degrade bottom habitat, which can affect the distribution of marine mammal prey. If oil or gas is to be transported by pipeline, either buried or on the seafloor, more construction activity is required and therefore more sound would be emitted and seabed disturbance can result. Finally, all of these activities may increase the amount of debris in surrounding waters and thus increase ingestion hazards for marine mammals. The production stage involves the drilling of one or more wells, extraction of oil and gas, and transport of the oil to refineries and the gas to markets, either through pipelines or in tankers. Depending on the size of the reservoir and the recovery rate, an oil and gas platform may be productive for several decades or longer. Seismic surveys may be conducted on a regular basis to guide drilling activities and monitor changes within the reservoir and the pipeline. Both drilling and seismic activities generate sound that may be harmful to marine mammals. Vessel and aircraft activity is a source of chronic disturbance and vessel activity can increase the potential for ship strikes and fuel spills. Drilling produces muds and cuttings that may be discharged near the well site, injected back into the ground, or collected and disposed of off-site. Certain types of muds and cuttings can introduce heavy metals and other toxic materials into the marine ecosystem. If produced oil is to be transported by vessel, mooring systems may be required with associated anchoring and potential disturbance of seafloor habitat. When economic conditions and conditions within the well reservoir indicate that oil and gas production is no longer warranted, well production is discontinued and the platform and associated infrastructure are decommissioned. This stage of development can result in disturbance of sediment and the discharge of metals associated with the severance, removal, toppling, and/or destruction of platforms, wellheads, cables, and other equipment and structures. Decommissioning can involve various types of non-explosive cutter tools, but a variety of explosives can also be used to remove underwater structures. Both non-explosive and explosive methods can introduce significant sound into the marine environment, which may be harmful to marine mammals and their prey. Abandoned wells also have the potential to leak oil and gas. Under certain circumstances, platforms (or portions of them) may be left in place, where they serve as artificial reefs. Spills and leaks can occur at all stages of oil and gas development, with varying effects based on the type and amount of substance spilled. Large spills (defined as > 1,000 barrels) can occur from blowouts, other losses of well control, or accidents during loading, transport, and unloading of oil or gas from platforms to shore via vessels or pipelines. Smaller spills and leaks of oil, gas, or other chemicals also can occur from storage tank accidents, transfer mishaps, leaks from fuel tanks, or incidents involving temporarily or permanently abandoned wells. Spills and leaks can cause acute injury or mortality, can have longer-term, sublethal effects on marine mammals, and can degrade habitat. The Bureau of Safety and Environmental Enforcement (BSEE) responsible for the promotion of safety and protection of the environment through regulatory oversight and enforcement of regulations governing the oil and gas industry. BSEE has proposed significant new regulatory safeguards to prevent oil spills based on lessons learned from the Deepwater Horizon oil spill, as well as new drilling rules for the Arctic. Response efforts to contain and clean up oil spills also have the potential to affect marine mammals through increased sound from vessel traffic as well as increased risk of ship strikes. During the Deepwater Horizon oil spill chemical dispersants were used both at the surface and at depth to disperse oil. Although research on the effects of dispersants increased after the spill, information about those effects on marine mammals is lacking. The use of booms and skimmers to contain and collect surface oil and the burning of oil on the water surface are activities that also have the potential to disturb marine mammals. Burning reduces the overall amount of oil in the marine environment. However, burning also leaves behind a residue of uncertain composition and toxicity, puts additional chemicals into the air, and can kill animals such as sea turtles that get caught in the fires. For a summary of the likely impacts of oil spills and response efforts on marine mammals, see the Commission’s report, Assessing the Long-term Effects of the BP Deepwater Horizon Oil Spill on Marine Mammals in the Gulf of Mexico: A Statement of Research Needs. Sections 101(a)(5)(A) and (D) of the MMPA provide a mechanism for the National Marine Fisheries Service (NMFS) and the U.S. Fish and Wildlife Service (FWS) to authorize the incidental, but not intentional, taking of small numbers of marine mammals by oil and gas companies or seismic operators. Takes may be authorized provided they would be (1) small in number, (2) have no more than a negligible impact on marine mammals, and (3) have no unmitigable adverse impact on the availability of marine mammals for subsistence uses by Indians, Aleuts, or Eskimos who reside in Alaska (Alaska Natives). Take authorizations for oil and gas activities typically include a suite of mitigation, monitoring, and reporting measures with which operators must comply to prevent or reduce the adverse impacts of oil and gas development on marine mammals. Mitigation measures for seismic or other sound-generating activities may include ensuring the area is clear of marine mammals prior to the start of operations, gradually increasing the intensity of the sound source to alert marine mammals that may be in the area so that they can move away, shutting down or powering down the sound source if marine mammals approach close enough to be injured, and prohibiting operations at night or during low-visibility conditions. 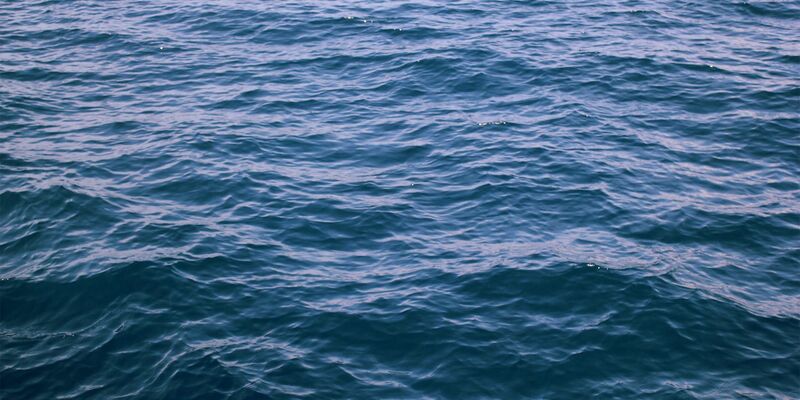 To minimize the probability of vessel strikes, vessels may be required to slow down within a certain distance of marine mammals. Aircraft operating in an area may be required to fly above a certain altitude to avoid disturbing marine mammals. Proposed activities also may be prohibited in sensitive areas at specific times (such as during calving, breeding, feeding, or resting, or during subsistence hunting in Alaska). General and site-specific mitigation measures are based, to the extent possible, on observations of animals exposed to various industrial activities and the animal’s hearing abilities and behavioral response. Nevertheless, the effectiveness of many mitigation measures has yet to be determined. Alternatives to seismic airguns include the use of marine vibroseis (which is typically used on shore), deep-towed acoustics/geophysics systems, low-frequency passive acoustic systems, and controlled source electromagnetic systems. Some have the potential to replace seismic airguns for offshore surveys, but all are still in development and most are not yet commercially available. Monitoring for the presence of marine mammals in areas around and potentially affected by oil and gas activities serves two main functions. First, monitoring is necessary to implement mitigation measures, such as a power-down or shut-down of the sound source. Second, monitoring should document the effects of an activity, including the number of marine mammals taken and the type of taking. Such information is useful for evaluating the effectiveness of mitigation measures and refining or developing such measures for future activities. Marine mammal sightings must be documented and reported to the agency that issued the incidental take authorization, both during an activity and at its completion. Immediate reporting of a dead or seriously injured marine mammal is also required, with immediate suspension of operations if the death or injury might have been caused by that activity. Learn more about the history of oil and gas development in the U.S. OCS.